Veteran guard Avery Bradley will be the latest Grizzlies player to miss time with an injury, as the club announced today (via Twitter) that Bradley will be re-evaluated in a week after being diagnosed with a right shin contusion. The news comes on the heels of a Tuesday announcement that C.J. Miles will be sidelined for the rest of the season due to foot injury. Bradley and Miles join a list of injured Memphis players that also includes Dillon Brooks, Kyle Anderson, and Jaren Jackson. A team can receive an extra roster spot via the hardship provision if it has four players who have missed three (or more) consecutive games and are expected to be out for at least two more weeks. While not all of the recovery timelines for those injured Grizzlies are known, the club could soon qualify for that exception and still has enough room under the tax line to sign a 10-day contract or two, if necessary. For now, Mike Conley, Justin Holiday, and Delon Wright figure to carry the majority of the backcourt load, with youngsters Jevon Carter and Tyler Dorsey perhaps getting a longer look as well. As David Cobb of The Memphis Commercial Appeal details, the Grizzlies’ latest injuries come at a crucial time for the club. While Memphis isn’t going to make the playoffs, the club wants to finish the season strong to increase the odds of its protected first-round pick conveying to Boston this season. The pick, which is top-eight protected, would have reduced protection in future years when the Grizzlies may be in full-blown rebuilding mode, so the team would prefer to settle that commitment sooner rather than later. Currently, the Grizzlies are tied for sixth in 2018/19’s reverse standings, putting them in position to keep their first-rounder. The fate of the Grizzlies‘ first-round pick might influence whether the team brings back Avery Bradley next season, according to Chris Herrington of The Daily Memphian. Acquired from the Clippers at the trade deadline, Bradley has a $12.96MM contract for 2019/20 that doesn’t become guaranteed until July 3. Unless the team undergoes major changes during the summer, Memphis will be keeping a close eye on its luxury tax situation. The Grizzlies made Mike Conley available prior to the deadline, but if he returns and Jonas Valanciunas and C.J. Miles both opt in, their contracts – along with Chandler Parsons – will put the team over the salary cap. Memphis would be pushed into tax territory if it keeps Bradley while bringing back restricted free agent Delon Wright, signing a high lottery pick and using its mid-level exception. The Grizzlies’ pick will convey to Boston if it falls out of the top eight. Memphis is in sixth place in our latest Reverse Standings, three games above the Mavericks and Pelicans, who are tied for eighth. Bradley has been good since joining the Grizzlies, averaging 15.3 PPG in six games, but Herrington says the decision will come down to whether management views him as a bargain at next year’s salary. The Grizzlies would welcome back Joakim Noah, but at age 34, he may be more interested in joining a contender. After a disastrous experience in New York, the veteran center has resurrected his career in Memphis. However, the Grizzlies don’t have his Bird rights, so they would have to either open cap room or use an exception to pay him more than the veteran’s minimum. Bruno Caboclo‘s defensive versatility may be enough for the Grizzlies to bring him back for another year. Memphis doesn’t have another bench player with size who can guard the perimeter, making Caboclo valuable even with his limited offensive game. After a pair of 10-day contracts, the Grizzlies signed the former first-round pick for the rest of the season, along with some guaranteed money for 2019/20. The trade deadline worked out poorly for rookie guard Jevon Carter, who has only played three minutes over the last three games. The Grizzlies kept Conley and traded for both Bradley and Wright, who are all ahead of him in the rotation. Carter may not get a chance to display his skills in Memphis as long as all three stay with the team. 6:41pm: The trade between the Grizzlies and Clippers is official, both teams announced in press releases. The Clippers also confirmed the waiving of Marcin Gortat. 1:07pm: The Grizzlies have reached an agreement to trade swingman Garrett Temple and power forward JaMychal Green to the Clippers for shooting guard Avery Bradley, Adrian Wojnarowski of ESPN tweets. The trade allows the Clippers to clear a little more cap space in their pursuit of top free agents this summer. Temple has an expiring $8MM contract, while Green is making $7.7MM in his walk year. The Clippers will open up $2MM more in cap room this offseason, giving them a projected $59MM to chase the best players in the free agent class, according to ESPN’s Bobby Marks (Twitter links). Bradley is making $12MM this season and $12.96MM next season, but only $2MM of next season’s salary is guaranteed. Memphis has until July 3rd to fully guarantee his salary, something a rebuilding club is unlikely to do. The Grizzlies will create a $7.6MM trade exception as well as open up a roster spot as they finalize a deal sending center Marc Gasol to the Raptors. Green will receive a $200K bonus if the Clippers reach the first round of the playoffs, Marks adds. With the Clippers having a full roster prior to the trade agreement, they will open up a spot to complete the 2-for-1 deal by waiving center Marcin Gortat, Shams Charania of The Athletic tweets. Los Angeles will thus eat the remainder of his $13.565MM contract this season. Gortat was due to become an unrestricted free agent this summer. Bradley, who has started all 49 games in which he’s played this season, is averaging 8.2 PPG. Gortat started 43 of 47 games, averaging 5.0 PPG and 5.6 RPG. Green was the Grizzlies’ fourth-leading scorer despite coming off the bench in all but four of 41 games, averaging 9.8 PPG and 6.1 RPG. Temple, acquired from the Kings during the offseason, started 49 games and averaging 9.4 PPG. Kings coach Dave Joerger sidestepped questions about his job status following Saturday’s game, relays Ali Thanawalla of NBC Sports. Joerger has Sacramento off to a surprising 8-8 start after last year’s 55-loss season, but a report last night suggested philosophical differences exist between the coach and front office regarding minutes for younger players. Joerger turned away follow-up questions about his job, saying, “I’m not going to get into that stuff.” He has a 67-113 record with the Kings and is signed through the end of next season. After missing the playoffs last season, the Clippers are making a strong statement with a 10-5 start and will be in position to get even better next summer, notes Tom Ziller of SB Nation. The team is 5-1 since inserting rookie guard Shai Gilgeous-Alexander into the starting lineup and ranks first in the league in opponents’ effective field goal percentage. With only five players signed beyond this season, L.A. could have up to $63MM in cap space in July, enough to offer two max contracts. However, Ziller states that the Clippers’ ultimate plan is to attract Kawhi Leonard, re-sign Tobias Harris and add a few complementary players around them. When Devin Booker underwent surgery on his injured last hand in September, the Suns estimated that it would take six weeks for him to recover and return to the court. Based on that timeline, Booker would miss the first week of the regular season, but the 21-year-old is still aiming to get back on the court for Phoenix’s season opener, according to Marc J. Spears of The Undefeated (Twitter link). The Suns’ season will begin next Wednesday night when the team hosts the Mavericks in what has been billed as a showdown between two of this year’s top rookies, Deandre Ayton and Luka Doncic. The Suns cleaned house in their front office on Monday, with a team source confirming to Adam Johnson of 2 Ways & 10 Days (Twitter link) that Louis Lehman, the GM of Phoenix’s G League affiliate, was fired. GM Ryan McDonough, assistant GM Pat Connelly and director of scouting Courtney Witte were among the other executives let go by the club. 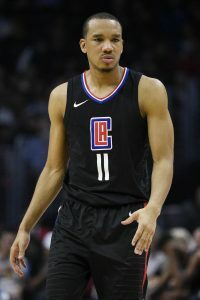 The Clippers‘ success in 2018/19 may hinge in large part on the health of Avery Bradley, writes Broderick Turner of The Los Angeles Times. Bradley, who re-signed with the Clips over the summer, only has a small partial guarantee on the second year of his new contract, so he may return to the free agent market in 2019 if he’s slowed by injuries again. With Patrick McCaw still unsigned, there may be an opportunity for Danuel House to earn a regular season roster spot with the Warriors. Anthony Slater of The Athletic (subscription required) takes a closer look at House’s case for a place on the 15-man squad. After initially reaching a free agent agreement with Philadelphia, Nemanja Bjelica changed course and inked a three-year deal with the Kings. Now, he’s showing off his ability to open up the floor for his new team, as Jason Jones of The Sacramento Bee details. While Nikola Jokic‘s new five-year deal with the Nuggets was reported as a maximum-salary contract, that’s not technically accurate. According to ESPN’s Zach Lowe (via Twitter), the base value of Jokic’s new deal falls just short of the max, since it includes about $1MM per year in bonuses linked to team success. As Lowe explains, about half of those annual bonuses can be earned if the Nuggets make the playoffs, while the other half can be earned if the club advances to the second round. Because Denver didn’t achieve either of those benchmarks in 2017/18, those bonuses are currently considered “unlikely” incentives and don’t count against the Nuggets’ cap. In 2018/19, for instance, Jokic’s cap hit will be about $24.6MM rather than the maximum $25.5MM, tweets Eric Pincus of Basketball Insiders. However, if the Nuggets were to win a playoff series in 2019, Jokic would earn his first-year bonus and his second-year bonuses would subsequently be considered “likely,” causing his future cap hit to increase. Elfrid Payton, who was signed using most of the Pelicans‘ bi-annual exception, got a flat $3MM salary for 2018/19 (Twitter link). As expected, the Nuggets used a portion of their mid-level exception to sign Torrey Craig to his new two-year deal. Craig will earn a flat $2MM salary in each season, for a $4MM total (Twitter link). Avery Bradley has a fully guaranteed $12MM salary in the first season of his two-year contract with the Clippers, but only $2MM of his $12.96MM salary for 2019/20 is guaranteed (Twitter link). The Clips will have to make a decision on Bradley’s second-year guarantee by July 3, 2019. The Knicks gave second-round pick Mitchell Robinson guaranteed salaries of $1.5MM and $1.6MM in his first two years, with non-guaranteed minimum salaries in years three and four (Twitter link). The four-year deal, which has a team option in year four, should be worth just shy of $6.6MM in total. Sviatoslav Mykhailiuk‘s three-year contract with the Lakers has a guaranteed first-year salary of $1,487,694, followed by non-guaranteed minimum salaries for years two and three (Twitter link). The third year is a team option. JULY 9, 6:03pm: The signing is official, according to the team’s Twitter feed. JULY 3, 3:09pm: The second year of Bradley’s contract features only a small partial guarantee, according to ESPN’s Zach Lowe (Twitter link). If the Clippers want to move on from the guard after year one, they’d only be on the hook for a total of $14MM. JULY 2, 11:55pm: The Clippers will bring back free agent guard Avery Bradley, according to Shams Charania of Yahoo Sports, who reports (via Twitter) that Bradley will sign a two-year, $25MM contract to remain with the club. Bradley, 27, had an eventful contract year in 2017/18. He was traded from the Celtics to the Pistons during the 2017 offseason when Boston needed to clear cap room to sign Gordon Hayward, then was flipped to the Clippers midway through the season in Detroit’s blockbuster acquisition of Blake Griffin. Plagued throughout the year by a sports hernia that ultimately ended his season early, Bradley wasn’t at his best in 46 total games for the Pistons and Clippers. For the season, he averaged 14.3 PPG, 2.5 RPG, and 2.0 APG with a shooting line of .414/.369/.768. Because the Clippers held Bradley’s Bird rights, the team had the ability to go over the cap to re-sign him, leaving the mid-level exception available for another deal. Known for his stout perimeter defense, Bradley will rejoin a backcourt that currently features Sixth Man of the Year Lou Williams, incoming rookies Shai Gilgeous-Alexander and Jerome Robinson, second-year guard Jawun Evans, and veterans Milos Teodosic and Patrick Beverley. Teodosic’s days in Los Angeles may be numbered, as his 2018/19 salary is only partially guaranteed. Beverley doesn’t have a guaranteed deal either, but he seems unlikely to be waived unless his health is a serious concern. Beverley missed most of the 2017/18 season after undergoing right knee surgery to repair a microfracture and a meniscus injury. Bradley’s deal with L.A. is the team’s second contract agreement of the 2018 free agency period. The Clippers are also reportedly signing Mike Scott. A number of teams are interested in the services of Lakers guard Kentavious Caldwell-Pope following his one-year stint in Los Angeles, Michael Scotto of The Athletic tweets. Although the Grizzlies are the only team that Scotto specifically names, ESPN’s Chris Haynes adds that the Clippers will go so far as to meet with the swingman on July 1. In 74 games with the Lakers, Caldwell-Pope averaged 13.4 points and 5.4 rebounds per contests but while his career stat lines appear to have stagnated, he’s a renowned 3-and-D option still just 25 years old. As things stand, the Grizzlies have approximately $9MM in cap room for this season, which would be considerably less than the $18MM he signed on for with the Lakers last summer. The Clippers, with DeAndre Jordan‘s $24.1MM player option now off the books, will be able to offer slightly more than Memphis, approximately $14MM. In that situation, it’s likely that he’d replace pending free agent Avery Bradley. That doesn’t necessarily mean that the Clippers aren’t interested in bringing Bradley back, however, as Brad Turner of The Los Angeles Times reports. Bradley and the Clippers will also be in touch on July 1. Ironically, the Pistons essentially replaced then-restricted free agent Caldwell-Pope with Bradley last summer when the opportunity to acquire the latter from the Celtics came up ahead of the Gordon Hayward deal. The Suns are targeting Rockets forward Trevor Ariza, Clippers guard Avery Bradley and Lakers forward Julius Randle, tweets Kevin O’Connor of The Ringer. Phoenix will have about $18MM in cap space to work with after waiving Tyler Ulis earlier today. Ariza and Bradley are both unrestricted free agents and would provide a needed boost to the Suns’ defense. Randle is restricted, and the Lakers will have the chance to match any offer sheet he receives. Ariza, 33, has spent the past four seasons in Houston and was a steady two-way player on a team that won 65 games this year. He averaged 11.7 points during the season and shot 37% from 3-point range. Bradley, 27, was known as one of the league’s top defensive guards in Boston, but his game took a downturn after trades to the Pistons and then to the Clippers. A sports hernia limited him to just six games in L.A.
Randle is the youngest of the group at 23. After the Lakers decided not to give him an extension, he responded with a 16.1/8.0/2.6 season that has made him a popular free agent target. We heard on Thursday that multiple Warriors players are lobbying for the front office to go after Jamal Crawford in free agency, but Golden State isn’t the only team that will kick the tires on the veteran scorer. According to Marc J. Spears of The Undefeated, the Pelicans, Sixers, Cavaliers, and Nuggets are also expected to show interest in Crawford, who is focusing on finding the right fit. “For any player in free agency, fit and situation is so important,” Crawford told Spears. “You see players in one situation and they go to another and they look totally different. I’ve been around long enough to know that the player didn’t change. May just be the situation that he’s in. There is nothing wrong with that either. It’s all a part of growing and taking something positive out of that. In addition to working on re-signing Chris Paul and Clint Capela, the Rockets will also make an effort to retain Luc Mbah a Moute and Gerald Green, according to Spears, who suggests that Trevor Ariza could end up as the odd man out in Houston. Rajon Rondo and DeMarcus Cousins are good friends, but Rondo would like to re-sign with the Pelicans regardless of whether Cousins stays or goes, per Spears. The Grizzlies have interest in re-signing Tyreke Evans, but there’s a belief that he’ll be too expensive for Memphis to retain him, according to Spears. The Grizzlies don’t have Evans’ Bird rights, so they can only offer him their mid-level exception. Although Avery Bradley is considered likely to land elsewhere, the Clippers do have interest in re-signing him, a source tells Spears.